FP Logistics offers state of the art lighting equipment from fine brands such as American DJ, Chauvet, Elation, GLP, High End Systems, Martin and more! Automated: Automated lighting fixtures, or "moving lights", allow the user to remotely control functions and program simple or complex movements, patterns, colors, dimming and more! Special Effect: When you're trying to achieve a very specific effect, sometimes your conventional fixtures just won't do the trick. At FP Logistics, you can find a wide variety of special effect lighting fixtures to pull off the exact effect you're looking for! L.E.D. : LED lighting fixtures offer considerable savings in energy consumption and allow for a wide range of rich and saturated programmable colors. Atmospheric: Atmospheric effects are absolutely essential to complete certain lighting effects. At FP Logistics, you'll find a wide range of foggers, hazers and other atmospheric effects. Control & Dimming: If you want your lighting system to do exactly what you want, you're going to need control and dimming! 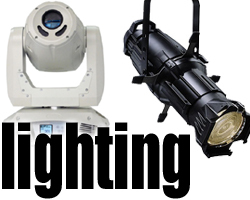 Rest assured, FP Logistics has the control and dimming equipment you need to get your lighting rig perfect! Accessories: Cables, clamps, hardware and more! Whatever it is, FP Logistics has the accessories you need to get your rig running exactly the way you want!